'We Don't Have A Strategy Yet' On Islamic State, Obama Says : The Two-Way But at a news conference, the president said the Sunni militant group was continuing to lose arms and equipment because of targeted U.S. strikes against its members in Iraq. President Obama said Thursday at the White House that the U.S. doesn't yet have a strategy on how to deal with the Islamic State militant group. President Obama says the U.S. doesn't "have a strategy yet" on how to deal with Islamic State militants who now control vast swaths of territory across Iraq and Syria, but he added that the militant group was continuing to lose arms and equipment because of targeted U.S. strikes against its members in Iraq. "I don't want to put the cart before the horse," Obama said at a White House news conference Thursday. "We don't have a strategy yet." He was responding to a question on whether he needed congressional approval to attack Islamic State targets in Syria. The president noted that the U.S. is continuing to carry out targeted strikes over Iraq to protect Americans there and to address the humanitarian situation on the ground. The Sunni militant group, in its brutal campaign, has carried out mass executions and targeted non-Muslims, including Christians and members of the tiny Yazidi community. 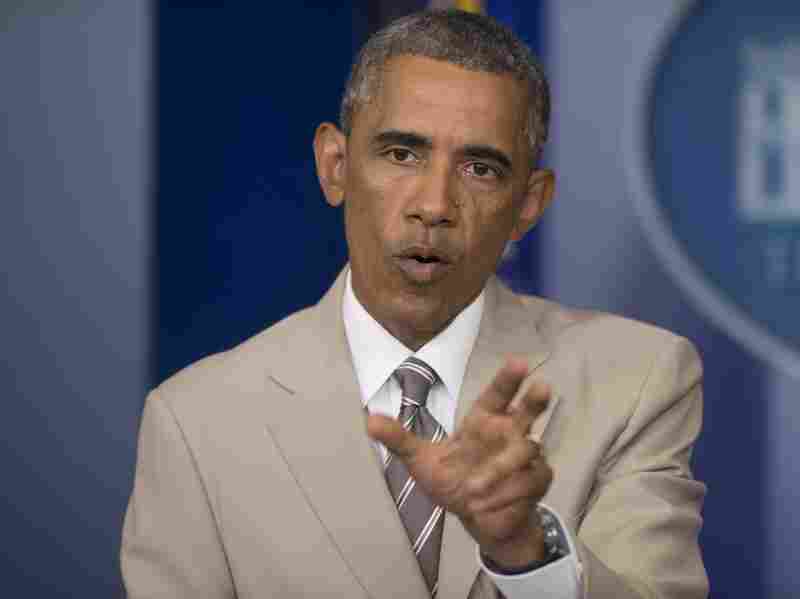 Obama noted that in some areas, Iraqi government and Kurdish forces have begun to push the militants back. "Rooting out a cancer like ISIL will not be quick or easy, but I'm confident that we can and we will, working with our allies and partners," Obama said. ISIL refers to the Islamic State of Iraq and the Levant, the former name of the Islamic State, which is also sometimes called the Islamic State of Iraq and Syria. Obama said he had asked U.S. Secretary of State John Kerry to travel to the region to build a coalition against the militants and that he had asked Defense Secretary Chuck Hagel and the Joint Chiefs of Staff to "prepare a range of options." He later added: "The options that I'm asking for from the Joint Chiefs focuses primarily on making sure that ISIL is not overrunning Iraq." "Our focus right now is to protect American personnel on the ground in Iraq, to protect our embassy, to protect our consulates, to make sure that critical infrastructure that could adversely affect our personnel is protected," Obama said in his opening statement. The administration's options against the Islamic State are complicated by the fact the militant group is one of many fighting to oust Syrian President Bashar Assad. The U.S. and its allies also want Assad gone. Indeed, Obama said Thursday that "Assad has lost legitimacy." Obama's news conference also dealt with the situation in Ukraine.